Crazy about hearts? Crazy about country ginham and plaid fabrics? 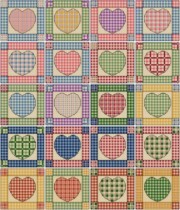 This cross stitch pattern started out as a single heart stitched as if appliqued to the center of a quilt block. Upon finishing the first one, I was hooked and simply couldn't stop at one. Each heart block measures 62 x 58 stitches and as independent blocks would make wonderful wall hangings if framed individually. Stitch several together for fun groupings or stitch them all! !